Fire boat response crews battle the fire aboard Deepwater Horizon in the Gulf of Mexico on April 20. 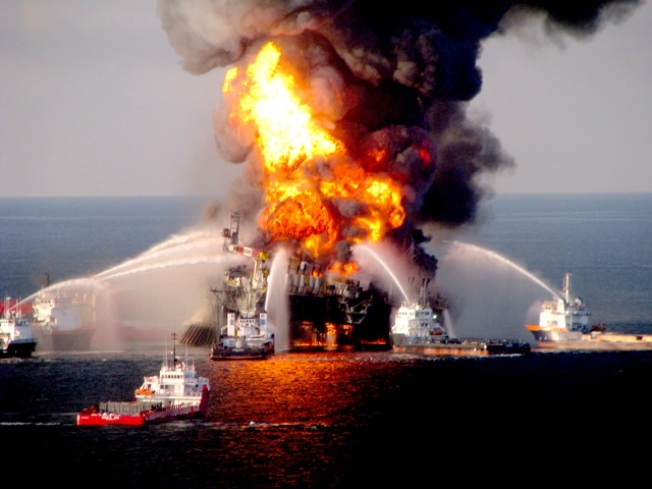 An independent researcher investigating the Deepwater Horizon oil rig accident has released preliminary findings, based on accounts from rig employees and others, that the accident was the result of a series of mistakes and flawed decisions, which had compromised safety. The researcher, Dr. Robert Bea, came to the nation's capital this week with that message about what went wrong on the Deepwater Horizon rig. Bea's been an engineer for 57 years, with experience investigating past disasters. An engineering professor at the University of California at Berkeley, he's a co-founder of its Center for Catastrophic Risk Management, and is the Center's principal researcher. After Hurricane Katrina, he helped lead an independent investigation into why the levees in New Orleans collapsed. On Thursday, Bea had a closed-door meeting in Washington with other members of the Deepwater Horizon Study Group, a group he's taken the lead in assembling to investigate the oil spill accident. The group consists of professionals from industry and government, many participating under conditions of confidentiality. "There is no doubt," Bea told NBC News Senior Investigative Correspondent Lisa Myers in an interview this week, "that safety was compromised." With few witnesses and officials with direct knowledge of what happened speaking publicly, and the results of official investigations months if not years away, Bea says that conclusion comes directly from information he and his group have already received from oil industry employees, including people who were on the Deepwater Horzizon platform when the accident occurred. Bea says the information includes interviews with 50 people with direct knowledge -- many under conditions of confidentiality -- and recordings of audio transmissions from the rig. Bea says the materials total 400 hours, stored in the group's database on a UC Berkeley server. Bea has spoken publicly before, but yesterday, one month after the accident, released a report of his preliminary analyses based on the information gathered. "This disaster was preventable," Bea writes, "had existing progressive guidelines and practices been followed." One of the early warning signs was belches or 'kicks' of methane gas, which came up from the depths of the well in the weeks before the accident. The gas was in slushy ice forms called methane hydrates -- but was potentially explosive. One incident was serious enough to shut the well down. "They had a catastrophic loss of drill fluid into the formation," Bea says. "Gas got to the surface. They had to bring the rig to cold operation." From what he's learned, Bea says, workers thought the successful response to that incident had fixed the gas problem in general. Dr. Robert Bea: There are time pressures that are extremely intense. And there are economic pressures that are extremely intense. Lisa Myers: So you saw a lot of cutting corners. Bea says the worst mistake was the decision to remove heavy drilling fluid, called "mud," from the drill column, as part of the end of the normal process to close down the well. Fine if the cements seals were working, he says. Potentially catastrophic if they weren't. Lisa Myers: "The critical decision was the one to remove that heavy mud?" Dr. Robert Bea: "That's based on everything we know. Yes." The biggest underlying problem of all, Bea says, is that "we horribly underestimated the risk." Throughout his interview with NBC News, Bea refers to the offshore drilling community as "we." He himself was once a consultant for BP, the lease operator and owner of the oil well at the Deepwater Horizon rig. He has worked with government regulators of the oil drilling industry for decades. Some employees on the Deepwater Horizon the day of the accident are friends and former colleagues. Bea says all the companies involved in the Deepwater Horizon accident probably bear some responsibility, but that most of the blame rests with BP and the federal government, because they failed to properly oversee the project. "These are not bad people," Bea says emphatically. "We're just doing dumb things." Lisa Myers: This report is damning. Dr. Robert Bea: I hope not. I hate damning... I hope it's constructive... I want learning to come from it. Not just more damn pain. There's enough of that around. After reviewing Bea's report, BP spokesman Andrew Gowers wrote in a statement to NBC News that the company is surprised Bea has so quickly reached any conclusions, based on incomplete information. BP says with many investigations going on and so much evidence to be examined, "we think it appropriate to await those findings before further comment on the causes of this terrible accident." Bea says he's been down this road before, after Hurricane Katrina. He says the revelations about why the levees failed then are similar to the revelations about why the oil rig failed now. "We had this long slide down this slippery slope of incremental bad decisions [regarding the levees]," Bea says. "This is following the same trail." "I think we've got the outline of the picture puzzle," Bea says. "The details are still missing. But I think we got the outline right."